A few months ago, I was at a Day Retreat organized by Josh Pinkston for the Foursquare pastors in our area. 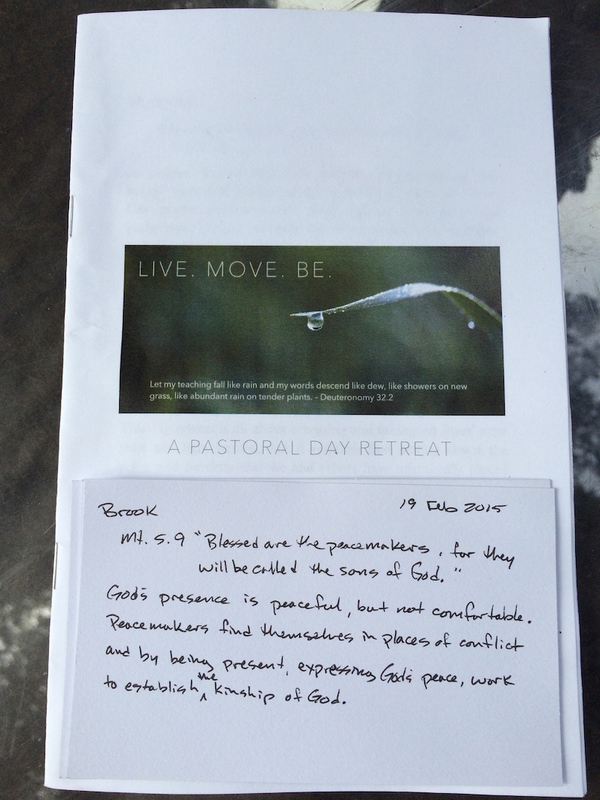 The focus of the retreat was prayer and meditation. Only four of us came. As we gathered, we took prayer requests. Then we dispersed to pray. As I looked over the prayer requests, including my own, they all seemed to embody a Beatitude, which provided a beautiful focus for prayer. Oddly enough, I found some blank notecards in my Bible. For each of the prayer requests I wrote down the Beatitude and a sentence or two of affirmation and encouragement. My prayer request was to be an instrument of God’s peace. This is what I wrote for myself. In my study of the Beatitudes lately, coming to this one brought back a flood of memories from that Day Retreat. The thing that stood out to me the most that day, and still does, is the idea of the kinship of God. This produced a sort of “if – then” formula in my mind. “If peacemakers are called God’s children, then God must be a God of peace.” This equation can also be flipped. “If God is a God of peace, then God’s children must be peacemakers.” This is where I find my heart. I want to be a peacemaker. Peacemakers are traditionally defined as, “a person who brings about peace, especially by reconciling adversaries.” I would like to redefine what a peacemaker is as one who creates an environment of peace. Peaceful environments can naturally bring about a resolution to conflict. Otherwise we are left with less than peaceful means by which we try to establish a conflict reduced situation based on contingency and condition. Not exactly peace. Last weekend, at the VLC Family Camp, getting kids to settle down and go to sleep in the cabin is always a challenge. At one point, our three younger children, who were seriously over tired for a day full of play, all started to melt down. I realized that Autumn and I had become ping-pong balls in the middle of their chaos, so I went over to one end of the room and sat on the floor. A few moments later, Lillian, the youngest, walked over to me sobbing and sat down on my lap. She calmed down and was soon in bed. The tension in the room was deflated, which allowed Autumn to help get the next two kids situated in bed. When we choose to not feed the conflict, the conflict will begin to resolve itself. One other example that I have come across that demonstrates peace through kinship is Father Gregory Boyle. He is the founder and executive director of Homeboy Industries in Los Angeles, CA. Their purpose is to “provide hope, training, and support to formerly gang-involved and previously incarcerated men and women allowing them to redirect their lives and become contributing members of our community.” The driving philosophy within the organization is “kinship.” Upon entering the Homeboy program, each person begins to understand that the person working next to them are their brother or sister, even if they are formerly from rival gangs. The environment of peace established by Father Greg and his staff empowers this concept of kinship, which translates to changed lives and renewed futures for those who work through this program. Here is a TED talk from Father Greg telling the story of kinship. Make sure you have tissues nearby! Peace is one of those ideals that humanity strives after for millennia, but striving doesn’t produce peace. Only peace produces peace. Peacemakers don’t make peace; they are peace! My hope is that people of peace establish environments of peace where the kinship of God can flourish through the act of being peace, a family of peace. This entry was posted in Uncategorized and tagged Beatitudes, community, family, gospel, peace, presence on June 12, 2015 by Brook Fonceca.